To the delight of some (ME) and the chagrin of others, Autumn has officially arrived here in Portland. I know if officially started late in September, but I always think of October 1 as the first day of Autumn here in the NW. The last few weeks saw some pretty intense storms (well, intense by Portland standards), and the garden was looking pretty beaten-down and sad for several days. Luckily, the weather evened out over the past week...and the garden has rebounded nicely. This past weekend was amazing...perfect weather for working out in the garden. 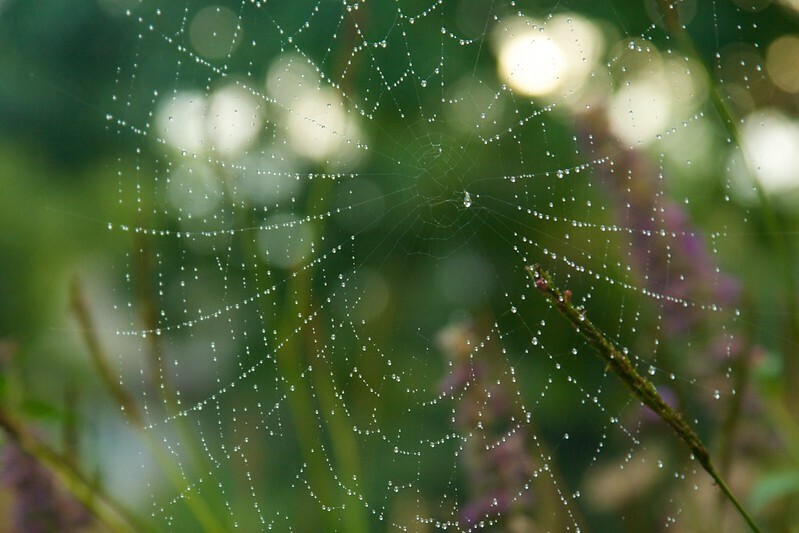 On Sunday morning, I happened to look out my the window of my little office and noticed how lovely and intricate this web looked covered in dew. I grabbed my camera and headed outside to take some pics. Of course, as I walked around, I found more delights...like this spangled bloom on Pennisetum 'Red Head'. The Little Bluestem (Schizachyrium 'Blue Heaven') have been coloring up nicely during the past few weeks and, as in the past, I'm utterly in love with them! At some point, I looked up for a moment and realized there was a light amount of fog hanging around...not enough to get moody fog photos...but just enough to add some atmosphere as the rising sun refracted off the moisture-laden air. 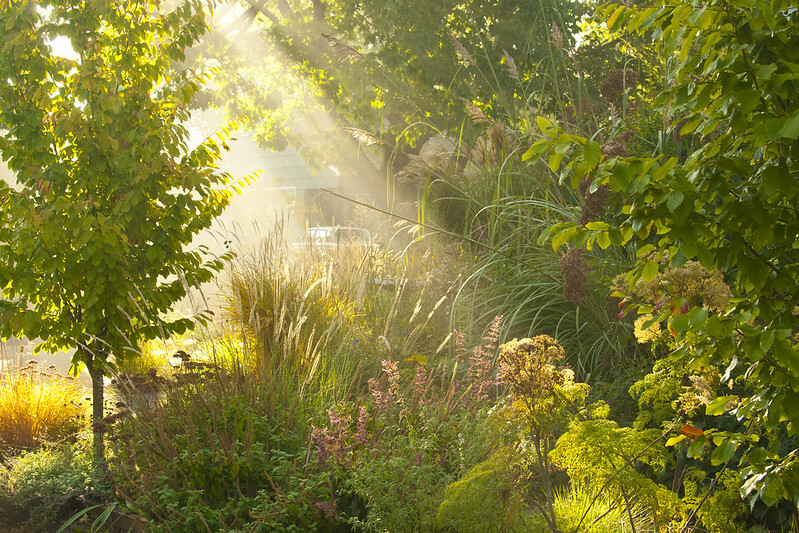 ...but as the sun climbed higher, the warm, slanting rays illuminated the garden...it was magical! It's amazing how a slight change in light or atmosphere can transform a garden. Suddenly, everything seemed moody, mysterious. The warm light from behind ignited the fog, casting a warm glow over everything. I walked around for quite a while, snapping photos like a madman...but stopping occasionally, just to enjoy this all-too-brief spectacle. Soon enough, the fog burned off, and the sun dried the previous nights moisture from the plants. 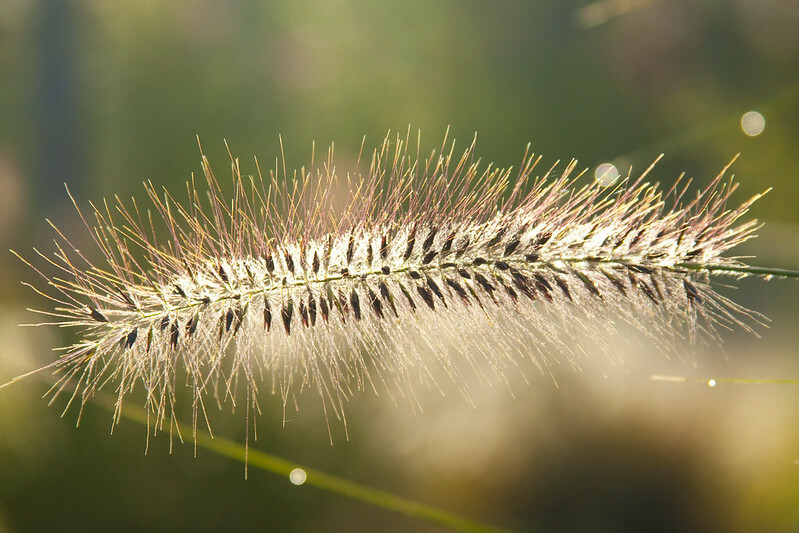 That same Pennisetum from earlier, now backlit and luminous. As I headed inside for another cup of coffee, Boots was waiting for me...for a scratch behind the ear...and a quick cuddle. So, even though we had already had the Autumnal Equinox and the return of the rains, for me, Autumn started that foggy morning in my garden...just me, the cats and the sound of hundreds of acorns falling like demented marbles from the trees above. Happy Autumn, everyone...I hope you're enjoying it! Autumn has arrived in your garden, not just in style but in glory as well! 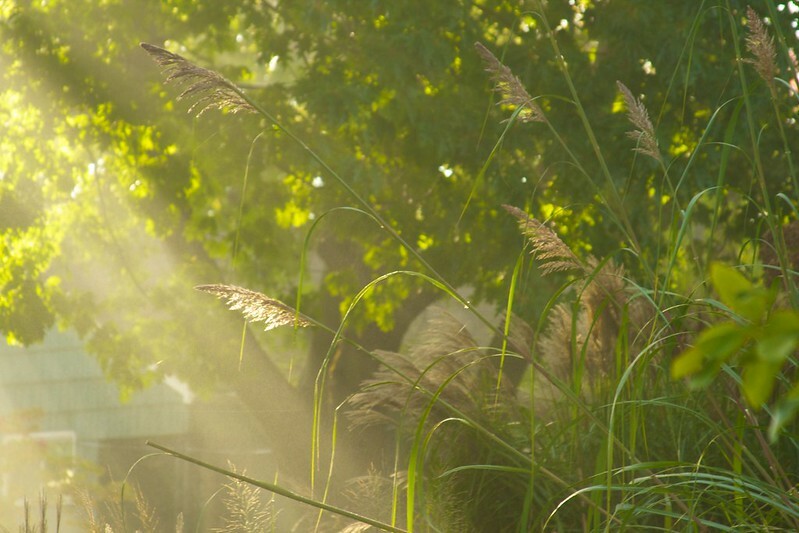 The grasses are at their element making your garden extra ethereal especially with fog, muted lighting, and raindrops here and there. You have truly captured the magical moments. and the cold is coming. You catch the most magical moments in your garden Scott! Your images are gorgeous and the story of your Sunday morning in words and pictures is glorious. 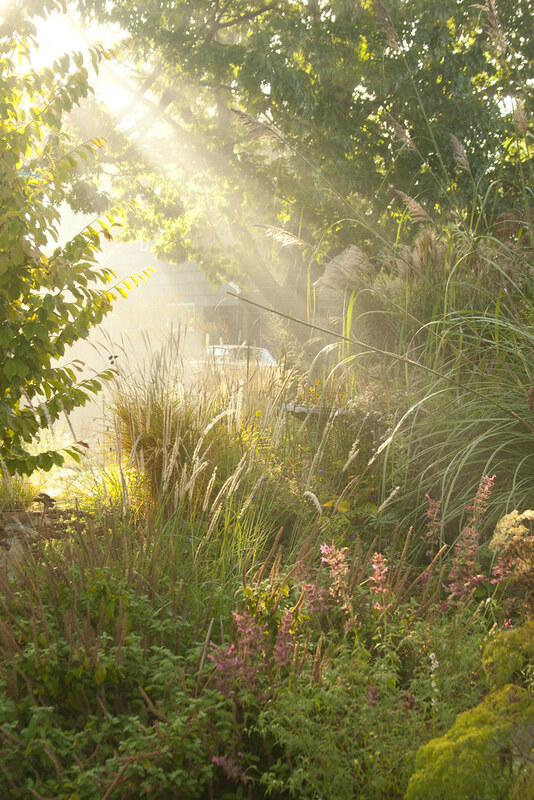 Love the golden morning and evening light that your garden gets and how beautifully you capture it with your camera! Your garden is an autumn garden, no question. You have made it glow in these pictures, soft and golden and beautiful, coming into its best season as it begins to fade. Even the cat is an autumn colored cat! The way you've captured the light in your pictures is just so masterful. If I tried that they would all be burnt out and too bright. Somehow you have found just the right balance. What a beautiful post about autumn. Замечательный сад и удивительные фотографии! Those truly are magical photos. Just beautiful. I am in AWE. When I take a foggy day picture , it just looks......blah. Wonderful! I'm wondering though: why is so little flattened? After heavy rains here I have many grasses and plants that take weeks to pull themselves up again -- sometimes they never do. What's your secret? I always find your garden magical. It's an indulgent treat for me to look at all of your photos. Happy autumn! Gorgeous! 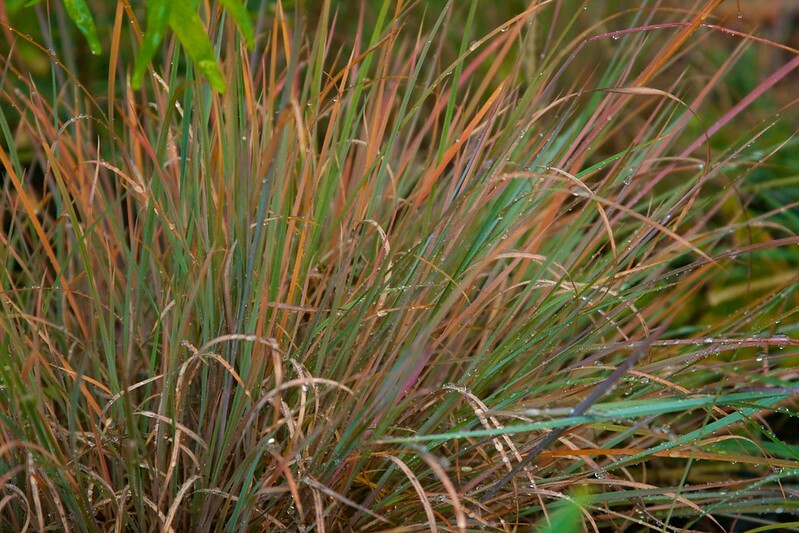 I'm adding The Little Bluestem (Schizachyrium 'Blue Heaven') to my plant wish list. Truly magical, Scott! Your ability to capture atmosphere is unparalleled. 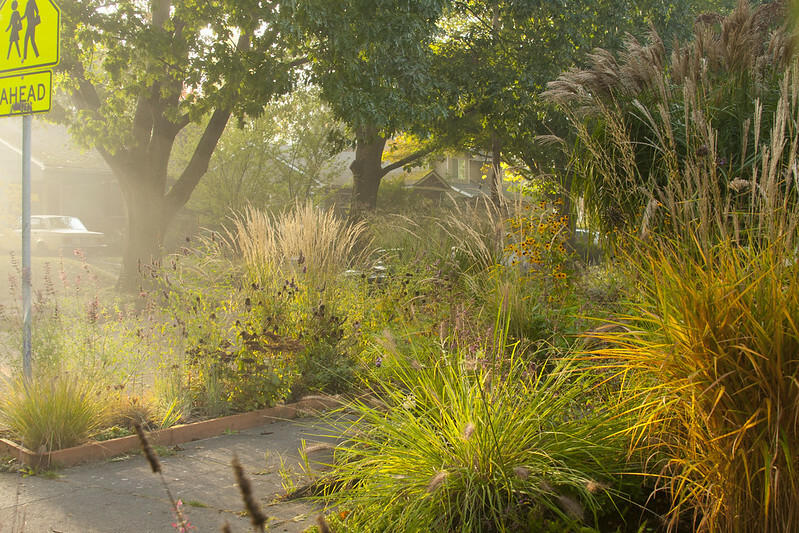 I'm understanding why you love your Little Bluestem so much - it's a beautiful bridge from summer into autumn. 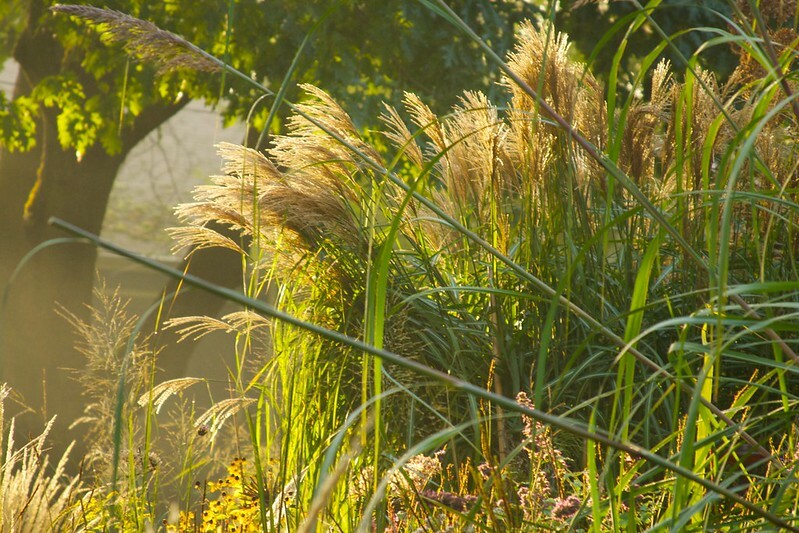 Your photos have given me an appreciation for the beauty and wonder of ornamental grasses, which I've been adding here and there to my garden at a steady rate. Sadly, we don't see the large number of choices offered by your nurseries in the PNW, though. One day, I really hope to have an amazing garden like yours. That light is amazing. I am obsessed with your weather and I check it daily. I've noticed that you have been below 60 for weeks now. Is that normal??? I see you've discovered the magic of morning in the gardens... too hard to explain, you just have to experience it. And I just did through your images. Beautiful. Sigh. Words just can't describe the beauty. Of course photos fall short, too, I know. But your photos are about as close as a person can get to capturing the magic without actually being there. Stunning, Scott! "Acorns falling like demented marbles" is the most wonderfully evocative phrase. Especially fabulous photos this time around, what perfect lighting! I can't believe how different the coloring on your Blue Heaven is than mine--I don't have those orange ribbons. I think they're trying to blend with Boots. Beautiful! I wonder if Boots realizes how perfectly he's coordinated with his surroundings. Me things he does, like a super model totally aware of how here coloring flatters the outfit. Some great photos here. Your grasses especially look amazing. Boots is adorable. 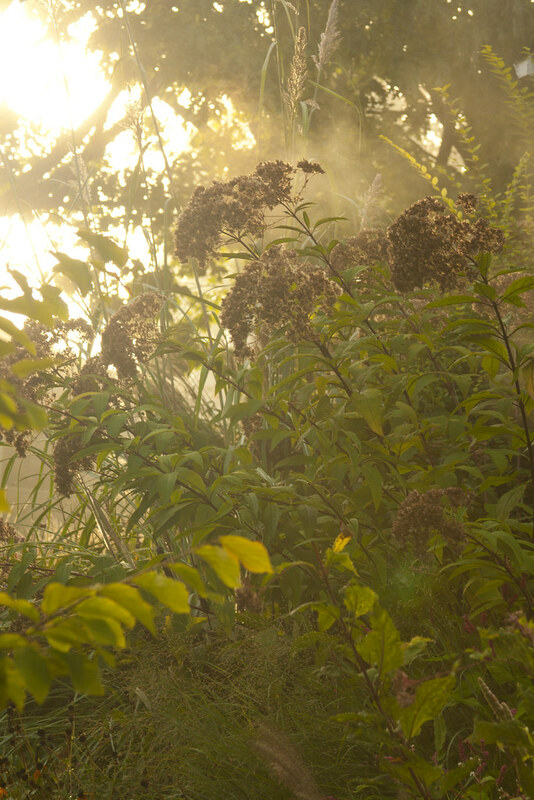 The morning mist and that light...I only captured such a rare event 1x at the old house, but it was divine. I forgot it was a work day..... Even forgot my coffee was losing it's warmth. The mist, I don't think it lasted for me before it evaporated. The grasses, ahhh! Down here, I consider fall Sept 1, even these last 2 years with 95-100F stuff hanging on. Ever thought of entering your photographs in a competition? or showing them off in a gallery? its difficult for me to take my eye off them. Great way to start my morning too. All that aside, how do you get the cat to sit still for the picture? 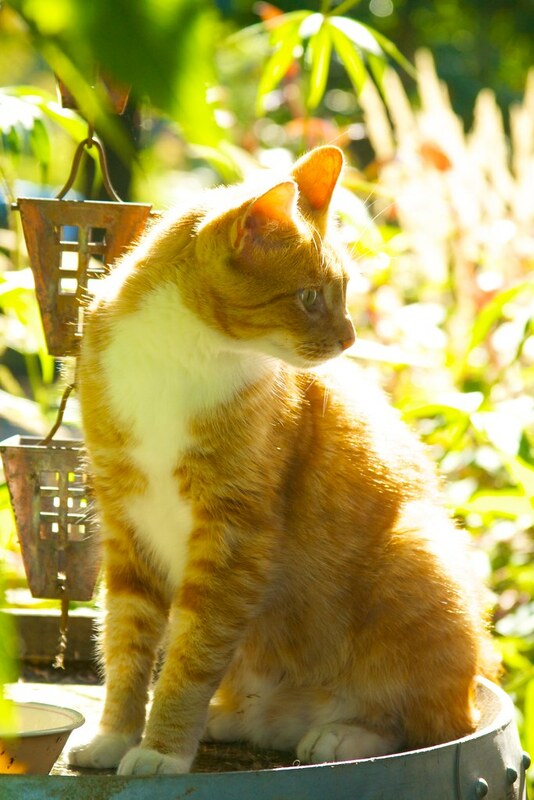 In my experience a cat would move just at the critical moment, when you wish it to be still... sweet creature! So glad that itsy bitsy spider lured you out into the garden to take these photos. S/He deserves a medal No, wait! Let's give the medal to you! Some great shots Scott. The backlit pennisetum looks like a furry caterpillar shimmering across the screen and what a studious pose from Boots. Yup, the scene was magical and your photos caught it well. There is something especially wonderful about autumn light, isn't there? It's all about the light--and the air, the moisture in the air. You captured a perfect moment in time. 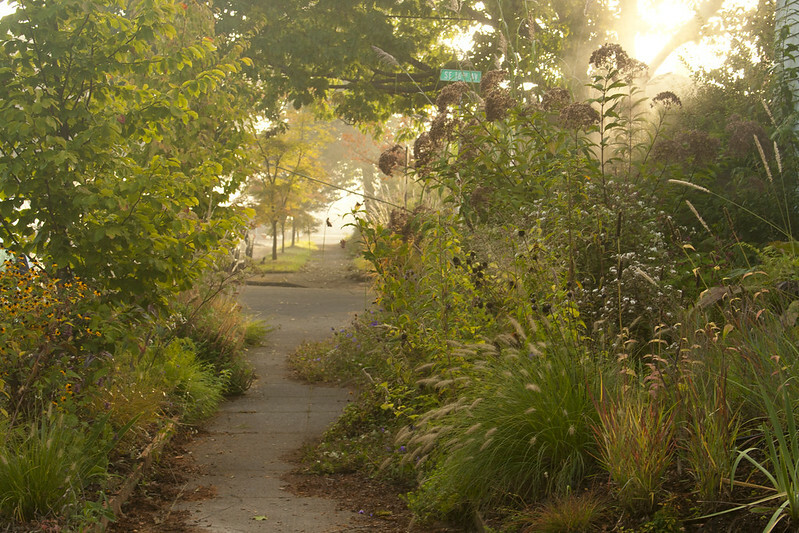 I don't know who could complain about fall in such light, in such a garden made to capture it as yours. Beautiful images, Scott. Magical is certainly the right word for it! Great portrait of Boots, too. I love the misty foggy photos, and the raindrop bejeweled grass seed heads. It does make everything look mystical. I noticed that at sunset and took some photos too. I love the grasses in my own gardens so much , too. You are one of the reasons I have spent so much time aquiring them and digging them form the wilds of Texas. You do great with them. My god, these are incredible photos! 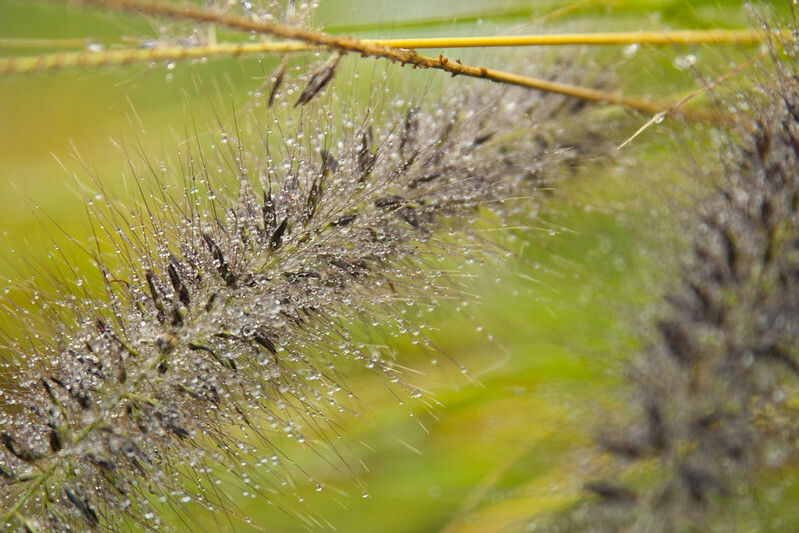 The grasses, light, and droplets of water are so beautiful! Makes me want to run out and buy a whole bunch of grasses right now! 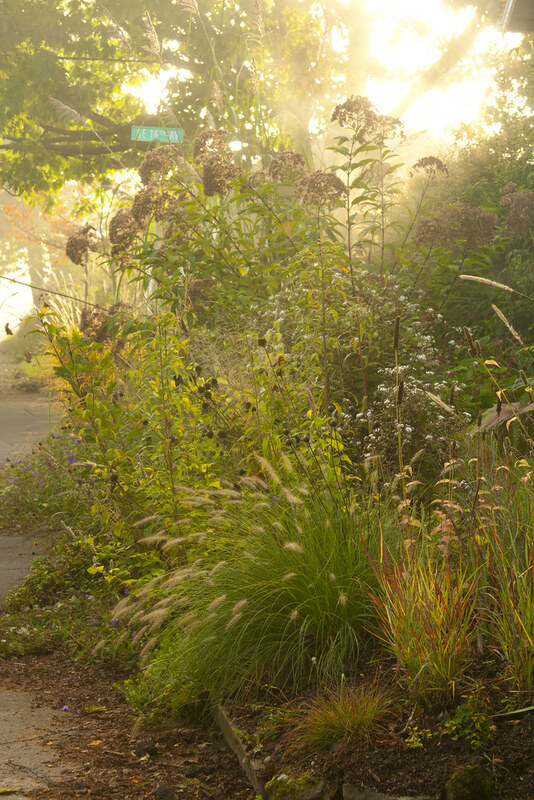 Scott your garden is looking dreamy in it s autumn finest...light, dew and fog...magical. Wow! 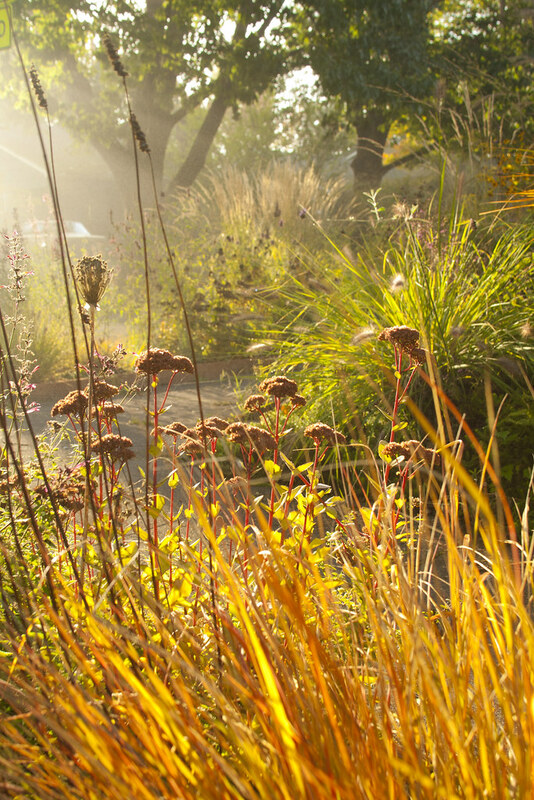 Your garden is looking spectacular in autumn and the photography is amazing! I always love watching your beautiful grasses change throughout the seasons. So fantastic, your garden is very pretty. I like the cat you are showing.